I’ve always had a hard time remembering dates. Whether it’s dates of famous historical events or even others’ birthdays, if it’s not written down on my calendar or if I don’t get a reminder/notification, I’m likely to forget it. It’s not that I don’t care, it’s just my brain has always been better with words than numbers. While I was thankful my mom was no longer suffering, for the first time in my life I learned what it meant to be truly heartbroken. I literally felt like a piece of me was missing. I wondered how I would live without her. She was not only a wonderful mom, but she was my friend and encourager. Other loved ones had passed away before, but this felt completely different. Here I was, at the age of 26, and my world was shattered. I had prayed for 9 years that God would heal my mom, and He chose to heal her in heaven rather than on Earth. I knew Romans 8:28 – “And we know that in all things God works for the good of those who love him, who have been called according to his purpose,” but I was questioning how God could bring something good out of this. Fast forward to the present. I can now see how God brought something good out of something so painful. Watching my mom endure so much through her battle with cancer has made me more empathetic. Losing her gave me a desire to help others who have experienced loss and are hurting. Through loss, I gained a new passion, and the purpose for my life became clearer. This revelation, along with incredible healing, came while taking a class through the Motherless Daughters Ministry. It’s a ministry that I am still involved with today as a volunteer. It brings me great joy to be able to support/encourage others on their healing journey. When God places a desire in your heart, trust that He will provide you with opportunities to fulfill that desire. Seven years later, my world no longer feels shattered, but it still feels different than before my mom passed away, and it will always feel different. It should. When someone’s absence impacts you just as much as their presence, that’s when you know he/she made a difference in your life. My mom made a lasting positive impact on my life, and I’m so thankful for that. I think about my mom everyday. I miss my mom everyday, and I always will. 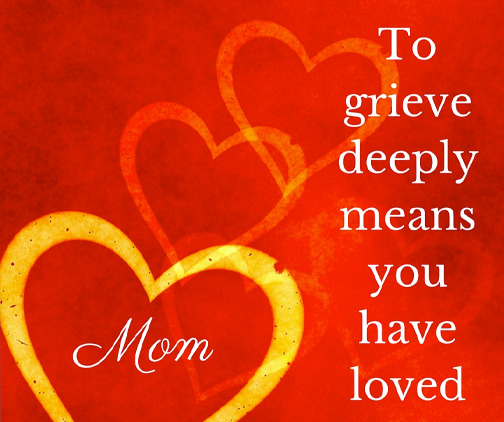 To grieve deeply means you have loved deeply. What do I miss most about my mom? It’s all the little things that I used to take for granted. I miss being able to pick up the phone and talk to her. I miss getting cards/letters from her in the mail. I miss sharing teaching stories. I miss running errands with her. I miss seeing her at the dinner table. I miss laughing with her. I miss listening to music and watching TV together. I miss her encouragement. I miss the sound of her voice. I miss just being in her presence. But when I start to miss her, I cling to the memories that remain – memories that remind me how blessed I am to have had her as my mom. But most importantly, I remember that she always made me feel loved. And that is something I’ll never forget.